Marcus Burghardt and Evgeni Plushenko. Francois Thomazeau on Yahoo reminded me that Marcus Burghardt was the guy on T-Mobile last year who crashed out with an unfortunate encounter with a dog. Bill Strickland posted a piece in the Wall Street Journal today about Wim Vansevenant and his probable historic triple Lanterne Rouge finish. He concludes: "Some cycling fans discover the lore of the Lanterne Rouge and become captivated by how it rewards fruitless struggle and alchemizes failure into a kind of success. You'll know you've become one of them if, Friday, you look first at the bottom of the standings instead of the top." Once again, I beg to differ with his assessment that Wim Vansevenant's string of Tour de France finishes - in any position - represent anything remotely resembling failure or defeat. No. Ricco's departure was defeat in disgrace. Magnus Backstedt's and Jimmy Casper's agonizing finishes while failing to meet the time cutoffs are glorious defeats. Wim Vansevenant is a survivor, and as he labors to support his team leader, Cadel Evans, every day of the Tour, he is perhaps the noblest representative of the self-effacing efforts of every domestique in the peloton who rides, unnoticed, in the essential support of every podium finisher. We fans have nothing but respect for him and his fellows. Just as predicted - sprinting sensation Mark Cavendish will not be climbing the Alps in the 2008 Tour de France. He does not plan to start tomorrow's stage. He made the appropriate noises to the media and was tactful enough not to mention his shot at a track cycling medal at the Olympics: "“It was really hard. We knew all along it was going to be hard. I tried to hang on, hang on,” Cavendish told Frankie Andreu at the finish line. “I’m just getting tired.”"
Thanks for the great show this year and good luck in your preparations for the Olympics, Mark! We'll be watching and cheering for you! The sorting has begun, and the tremendous talents are starting to show of many of the professional cyclists in the peloton who haven't yet gotten much recognition this Tour. It simply underscores the fact that every rider out there is a phenomenal athlete in his own right. (And also why it truly rankles me when riders at the bottom of the General Classification are derided as "losers". Unfortunately, since I'm catching up from being away I will have to skip most details of stages 8, 9 and 10). 169. EISEL Bernhard 45 TEAM COLUMBIA 6h 10' 51" + 31' 23"
170. CASPER Jimmy 123 AGRITUBEL 6h 10' 51" + 31' 23"
Two former Lanternes Rouges were making the headlines in Stage 10 yesterday. Leonardo Piepoli (Stages 1-3 Lanterne Rouge, 2005) came to the forefront finally as the stage 10 winner in an impressive ride along with his Saunier Duval-Prodir teammate Juan Jose Cobo Acebo. Yuri Trofimov, a Russian rider in his first Tour riding for Bouygues Telecom, withdrew from the race on Stage 10, reducing the peloton to 169 riders. 167. CASPER Jimmy 123 AGRITUBEL 4h 53' 33" + 34' 06"
168. EISEL Bernhard 45 TEAM COLUMBIA 4h 54' 22" + 34' 55"
169. CAVENDISH Mark 43 TEAM COLUMBIA 4h 54' 22" + 34' 55"
Eisel had been visiting the doctor as early as 36 km into the stage. Cavendish crashed at about 15 km before the finish line. Cavendish, the 2008 double stage winner riding for Team Columbia, was the Lanterne Rouge for Stage 8 of the 2007 Tour. 163. CASPER Jimmy 123 AGRITUBEL 44h 17' 05" + 1h 47' 56"
164. 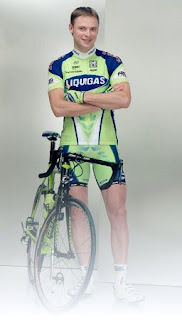 CHICCHI Francesco 63 LIQUIGAS 44h 17' 11" + 1h 48' 02"
165. EISEL Bernhard 45 TEAM COLUMBIA 44h 17' 42" + 1h 48' 33"
166. RIBLON Christophe 108 AG2R-LA MONDIALE 44h 18' 56" + 1h 49' 47"
167. AUGE Stéphane 182 COFIDIS CREDIT PAR TELEPHONE 44h 22' 19" + 1h 53' 10"
168. SPRICK Matthieu 146 BOUYGUES TELECOM 44h 24' 06" + 1h 54' 57"
169. VANSEVENANT Wim 9 SILENCE - LOTTO 44h 25' 48" + 1h 56' 39"
I also happened to notice that in the last 20 places in the overall rankings there are 9 French riders, and no French riders at all in the top 20 places in the standings. That must be very difficult for the French to see in their national race on their national holiday! Bill Strickland blogs about "First at being last" at Bicycling. Worth a read for followers of the Lanterne Rouge: "Yellow is fine, but this Tour's record-setting race for the Lanterne Rouge can't be missed." Although I would never categorize finishing the Tour de France - whether in 2nd or 162nd position - as anything remotely akin to "abject defeat". What about those who drop out of the Tour along the way? Repeatedly, even? Indeed, this is just about the time in the Tour when we typically start seeing our first cases of that notorious disease which strikes down pure sprinters who aren't doing well in the green jersey rankings, "Mountain Fever". Let's all keep an eye out for those. "Magnus Backstedt was caught by photographer Patrick Hertzog in an indelible portrait of agony, after sadly missing the time cut due to illness and exhaustion in yesterday's stage. Note the poignancy of the phantom hand of the spectator above him, attempting to keep him from falling. Something about this picture encapsulates the Tour for me. The epic scale of the human struggle, and the warmth of the true fans towards the deserving riders, whose great sacrifice is well acknowledged and honored. For every doper who sadly disappoints us, there is another valiant and clean rider whose courage and dignity even in the face of the bitterest defeat cannot be forgotten or overlooked." The problem to the rider having trouble on the road becomes that the cutoffs are a moving target and aren't determined exactly until the stage winner crosses the finish line - and even then they're often modified by the officials if a large number of riders would be affected. So sometimes a rider doesn't know with any certainty until well after the finish line if he will be permitted to continue. With the usual stories already covered by now, and the first time trial over, and no big heroes to write about, writers are starting to cast around for some human interest stories from the Tour and one of their old standbys is mentioning the Lanterne Rouge. Lionel Birnie in Cycling Weekly: "By the way, what's the deal with Wim Vansevenant? He just likes being last! The Belgian Silence-Lotto rider was Lanterne Rouge in 2007 and 2006. And he's last overall already, the crazy fool. And he's opened up a healthy lead of 2-10 over the next nearest rider, Matthieu Sprick. By the way, Vansevenant was second last in 2005." Whereas Road Cycling Blog just does a cut-and-paste on the Wikipedia entry. You're welcome. I'll try to include links to more of these mentions - there are sure to be many of them in the next couple of weeks. We've still got 17 stages to go. The rider page for Wim Vansevenant at the Silence-Lotto team website makes it clear that him earning an unprecedented and historic third Lanterne Rouge at the Tour de France is a personal - and perhaps team - goal. Here is a lovely translation of that page courtesy of Rose Cantine - many many thanks! (Earlier I had posted a very bad machine translation). "Vansevenant can seem cold and standoff-ish when you meet him for the first time. But don’t let first impressions fool you. This is his last season as a professional rider. For years, Vansevenant has served as the loyal domestique to Peter van Petegem. But, along the way, he has also proved to be very helpful in many races. Vansevenant is one of the few riders who can cover a lot of kilometers, close gaps and still maintain that pace for days thereafter. Last season, he succeeded in bringing the Lanterne Rouge title to Belgium twice in a row. A unique achievement, as only two riders have ever done this in the past. In 13 years as a professional rider, he won one stage in the Tour of Vaucluse, more than 10 years ago." "Vansevenant is comfortable with his role as a domestique. It is a role that one must not underestimate: closing gaps in the peloton, picking up bidons, riding in the wind, climbing mountains, etc. Few riders have developed the expertise that Vansevenant has in this role. He looks back on his cycling career with satisfaction. He is positive about the future of cycling especially given recent success in anti-doping campaigns and in training techniques. In 2008, Vansevenant will be an important participant in the greatest cycling competitions – the Tour of Flanders, Paris-Roubaix and the Tour de France. This year, he can set a record by becoming the only person to win the Lanterne Rouge title three times in a row." ". . . I spoke with [Evans'] team-mate and self-described “guardian angel” Wim Vansevenant. “Seve” as his team-mates call him is the heart and soul of Silence Lotto. He is listed in the Tour’s Guide Historique as a two-time winner of the Lantern Rouge, the prize for finishing last in the Grande Boucle. In any other sport, that would be a dubious honour, but not in this sport and especially not this race. “Seve” is a bloke who already should be awarded the Order of Australia for his work protecting Robbie McEwen over the years. He brings with him a working class “roll your sleeves up” attitude to getting the job done. It’s typical of the Belgians who live, eat and breathe the sport of cycling. The look in his eyes Saturday revealed more than words could say about the importance of his role protecting Cadel Evans. If you think it would mean a lot for an Australian to win the Tour de France, believe me, the Belgians feel just as strongly about bringing home cycling’s ultimate prize. If they can pull it off, Australia will owe a debt to this Belgian team that, from the outset, took a chance with an Australian G.C. rider who’d been plagued by injuries. It was concerning to hear both Vansevenant and Yaroslav Popovych were involved in incidents on course Saturday. I’m yet to get the full details, but according to Robbie McEwen, his good mate “Seve” went through a car window. Let’s hope both riders are fit to race on. Evans will need their help." Donald Munro speculates that Wim Vansevenant and Aleksandr Kuschynski were doing track stands on the way to the finish line. Cyclingnews reports that one of the early favorites for a top GC finish, Juan Mauricio Soler of Barloworld, may already be out of the Tour due to a fractured wrist bone, previously injured in the Giro d'Italia. Our first rider is out of the 2008 Tour: Cofidis rider Hervé Duclos-Lassalle went down and broke his wrist at the first feed zone 55 miles into the race, after getting his front wheel entangled in another rider's musette bag. Bad luck for him. The starting roster for the 2008 Tour was 180 riders, now down to 179. Jimmy Casper, Tour de France Lanterne Rouge of 2001 and 2004, has been named to the start list of the 2008 Tour de France by his team, Agritubel. Wim Vansevenant, also a two-time Tour de France Lanterne Rouge (2006 and 2007) has also been named to the 2008 Tour de France start list by his team, Silence Lotto. We fans of the Tour de France have been somewhat battered and disillusioned by events in recent years, but this is the kind of storybook matchup that will make the 2008 race worth watching. Good luck, gentlemen. Let the best man win!